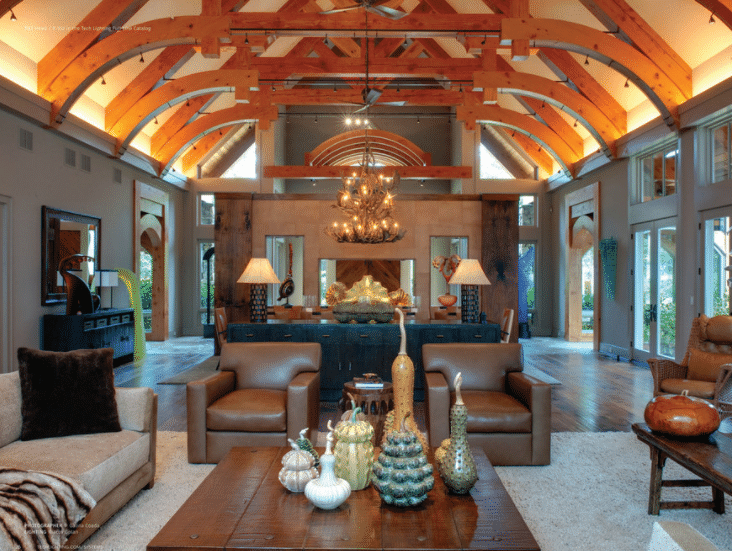 Post and beam ceilings are breathtaking, however, they can be difficult to light. Nothing can be screwed too deeply into the ceiling or it could diminishes the insulation value. So these ceilings have to be illuminated in a unique way. You can still use a chandelier, wall sconces, led tape, and track lighting. However, it must be planned for in advance and cleared by the building inspector to ensure it does not compromise the structure of the building. In the image above, they have mounted a large chandelier by most likely running a wire inside the bottom of the ridge pole. 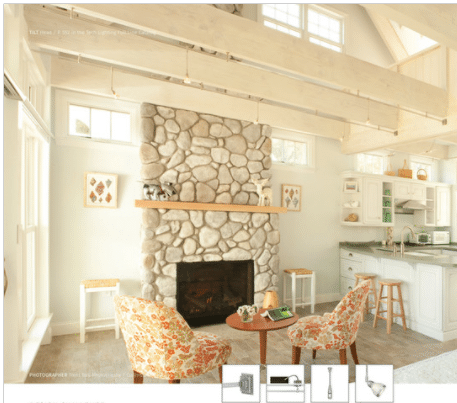 There are many tricks and tips to light your space if you have a post and beam ceiling. Let's look at some of our examples. 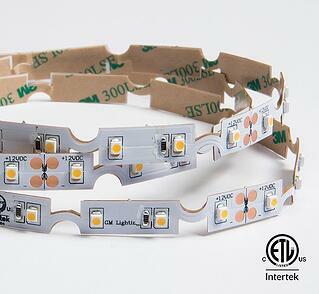 Led tape lighting is typically used to for uplighting and to sometimes emphasize the beauty of your wooden beams. Wall sconces can be mounted on vertical beams as long as the wires are put in surface mount conduits (metal pipes that mount on the ceiling or wall to run electric wires) or the beams. If that is the case, the conduits or beams would need to be made thick so they could be grooved out and bored for a pancake box without diminishing the integrity of the structure. The family room above is so large and high that very large chandeliers are required to match the massiveness of the room. The two chandeliers above are at least 4 feet in diameter by 5 feet in height. 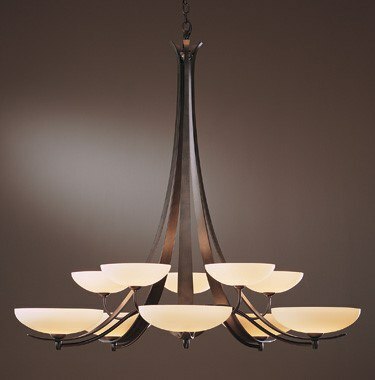 The Aegis from Hubbardton Forge above is 50" wide by 53.5" high for $7689. It takes ten 75-watt halogen bulbs, which are 750 watts, however, this is only as bright as 7000 lumens. 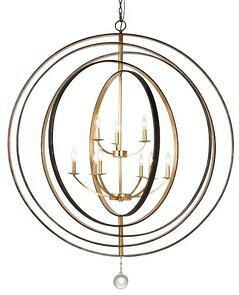 A Hubbardton forge below is the Simple sweep. It is 46”d by 53” high and costs $5698. Visual’s brand new Darlana family member is 50”w by 53” h and only $2414. It is an affordable option for the large spaces in a post and beams. The matching wall sconces are only $379 and are 11”d by 26 ¾”h . A slightly modern approach would be the Crystorama Luna 48”d by 58.5”h for $2300. In the design above, they have used Tech Monorail on the bottom of the beams. It is fed from the attic space above the ceiling of the adjoining kitchen where the transformer is also hidden. The little 2” square canopy is fed into the end of the rail and the 12-volt power runs down the stainless steel, ½” rail. 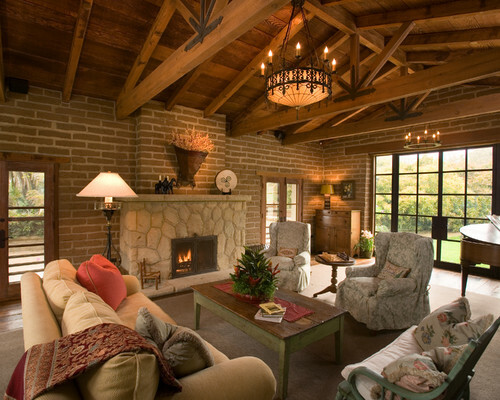 Now, the track heads can be tilted to cross illuminate that wonderful stone fireplace. The rest of the heads wash every 5 feet to evenly cover the space. If they decided to put a dinette table in the middle of that room they could hang pendants over the table in the future. This design allows for maximum versatility. 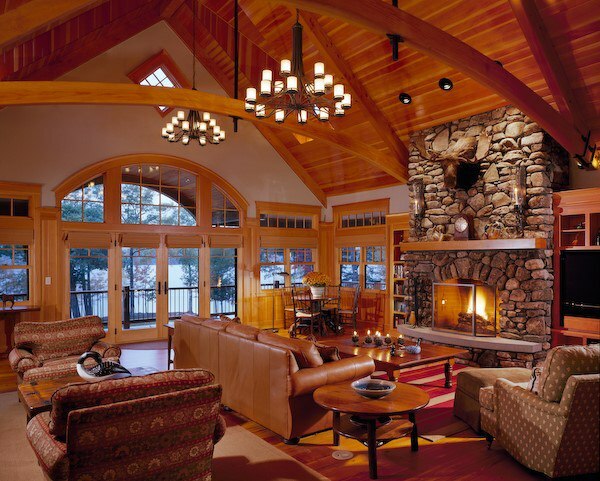 Above in this ski chalet, we can see the use of layering light. There is general, tasking, indirect, and decorative lighting properties being used. Notice the curved or bent Tech monorail on the bottom of the beams. This is the Aero heads for $129 and the MR16 round glass heads for $59 each. For the 8 foot rail, transformer, supports, power feed, and 5 track heads, you would be looking at approximately $1,590 total, depending upon your choices. Here they have used LED tape to light the headers and in between the rafters. This emphasizes the spectacular cathedral, lends a feeling of cheerfulness, and provided indirect reflective light. The new GM Twist-task can go around corners and in a circle with ease. It's 12v and needs a driver. The cost is best ever for $149 and drivers $179 for 17 feet. 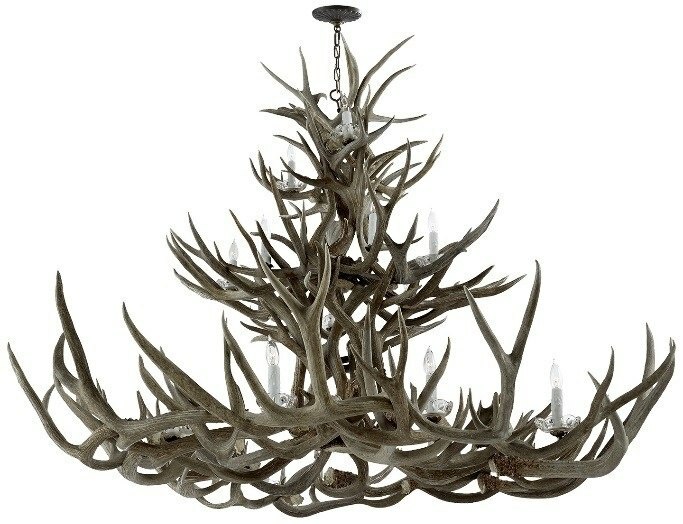 Also, notice the fun Antler chandelier “no deer have been harmed.” They have also used floor outlets to plug in lamps behind the easy chairs to provide task lighting. This Ralph Lauren 50’w by 53” high is constructed of real deer antlers. 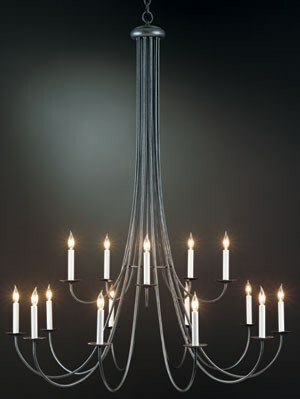 This chandelier is $20,999. If you liked this woodsy look or wanted more sophistication, one chandelier to consider is Elk Lighting's Crystal Branch Series. 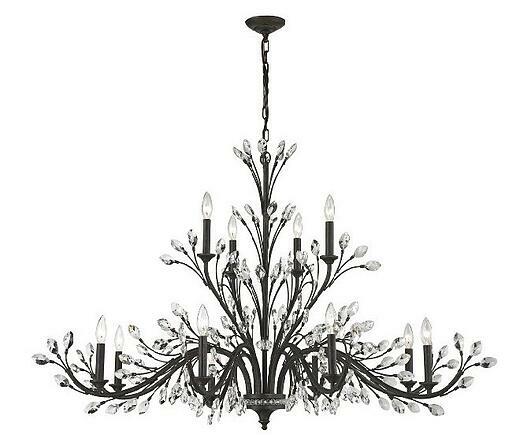 (Below) This chandelier is 50” by 31”h and has crystal leaves. It costs $2,049. The matching wall sconces are 12”w by 19’ tall and cost $270. The semi flush below is 24”w by 8”h for $518. Though lighting a post and beam ceiling may be challenging, chandeliers, paddle fans, wall sconces, LED tape, and track lighting are all possible choices. Ultimately, there is a myriad of possibilities. You can also add lighting by using table and floor lamps for reading or task-oriented activities. Whatever it is, check with your inspector and, of course, make sure it fits YOUR style. Want to learn more about lighting? Download our free Kitchen Lighting Buying Guide for detailed information on all the latest products and trends. Well over 250,000 people have read a Yale Guide.